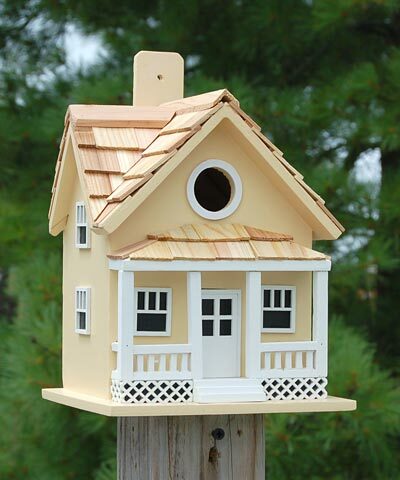 Place a relaxing roost for chickadees and wrens in your garden with the Home Bazaar Yellow Beachside Cottage Bird House. The fun details, white trim, and yellow hue add a dynamic look to your yard, while evoking a vacation retreat. A front porch with an extended roof captures attention with ease, its white posts, lattice, and rail contrasting the yellow home. Wooden shingles on the pitched roof further the realistic look, while the side gable offers birds extra room. A 1.25" diameter entrance hole sits above the porch, and the white trim around it brings bold definition. This opening leads to the spacious, unpainted interior, where your birds can create their nest. A hole on the base helps the unit remain dry, and a bit of screen beneath the entry forms a ladder for fledglings. The tall design of the home allows warm air to exit through the opening, and the back panel removes in moments for thorough cleaning or nest checks. The all wood construction furthers the classic look, and the attached hanging tab allows the unit to be displayed on a fence, tree, or wall easily. For more versatility, place the flat base of the home on a pedestal or post with a mounting bracket (not included). Offer songbirds a seaside retreat in your garden with this Yellow Beachside Cottage Bird House.